India and China are jointly ramping up efforts to trade more farm products from tobacco to rapeseed meal, which analysts said can be an effective way to solve the trade gap between the two Asian economies. The fact that China's agricultural trade relations with the US are under pressure because of the China-US trade dispute is also helping China and India to move closer to each other in farm products trade, analysts said. India and China signed the protocol for exports of Indian tobacco to China during a two-day visit by India's Commerce Secretary Anup Wadhawan to Beijing on Monday and Tuesday, according to a statement released by the Indian Embassy in China on Tuesday. Wadhawan met Zhang Jiwen, vice minister of the General Administration of China Customs (GACC), during the visit. Trade ties between China and India are getting increasingly closer as the two governments jointly make efforts to boost bilateral trade. According to information provided by the Indian Embassy, the GACC addressed some "long-pending" agricultural market access issues for Indian products, following understandings reached on these matters at an informal summit between India's and China's top leaders last year. The GACC has approved six Indian mills to export rapeseed meal to China. The protocol on exports of fish meal and fish oil from India to China was also signed in November 2018, according to information provided by the embassy. "The recent period has thus seen significant progress in market access for a number of agricultural and allied products from India [to China]," the Indian Embassy said in the statement. 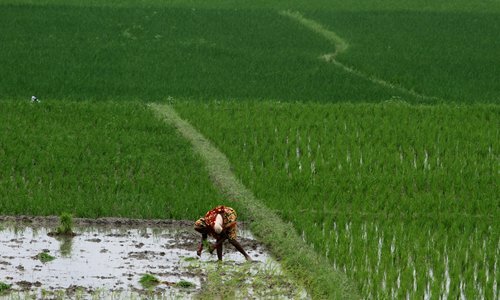 "Agricultural cooperation is a great opportunity to improve the current China-India trade situation, as India is a vast agricultural country and most of its farming products are non-genetically modified organisms," said Zhao Gancheng, director of the Center for Asia-Pacific Studies at the Shanghai Institute for International Studies. "The China-US trade friction also provided an opportunity for India to export more farm products, such as soybeans, to China," Zhao told the Global Times. Liu Xiaoxue, an associate research fellow at the Chinese Academy of Social Sciences' National Institute of International Strategy, told the Global Times on Tuesday that China wants to import more farm products from India, such as dairy products, as a way to improve the trade deficits India has with China. "India is the world's leading dairy producer and milk consumer. Moreover, Indian people don't eat bovine meat, hence, they could export the meat to China," Liu added. China imported $18.84 billion worth of goods from India in 2018, while it exported $76.7 billion worth of products during the period, according to customs data released on January 14. Overall, China's trade with India surged by 13.2 percent on a yearly basis last year. Experts also warned that it's hard to predict whether India's trade relations with China will improve stably and over the long term, as diplomatic relations between China and India have not been very stable in recent years. "The Indian government still watches out for China in many ways. For example, India still restricts some Chinese companies' investment in India, and that's why China's investment in India is quite limited," Zhao said, adding that for the time being, the two countries should connect closer and communicate more. Experts have also noted that the quality of goods made in India is not sufficient to provide a competitive edge in China, which has led to the trade gap. Zhou Rong, a senior research fellow at the Chongyang Institute for Financial Studies at the Renmin University of China, said that he was once told by an Indian government official that India "does not have much to sell to China," hinting that most Indian products can't have a distinctive advantage on the Chinese market for their lack of cheap price or high quality. Liu said that both India and China need to make some compromises to achieve further cooperation. "For example, India wants to protect its manufacturing industry, which China wants to enter. Meanwhile, India wants China to open up more in the services sector and allow Indian software engineers to work in China. I think both countries should understand each other's needs and make some concessions for each other," she noted.